Our charming lodging in Santa Rosa provides a tranquil and serene setting for relaxing during your Sonoma Valley vacation or the calm surroundings you need for a work trip. With fast Wi-Fi, all the space you need to focus or relax, and with all the small details taken care of, our rooms are a welcome getaway. Well-managed and clean, each room has stylish décor and modern furnishings. Our beds provide plush comfort to make sure you’re relaxed and restored on your way to your next stop. Enjoy high-quality linens and extra-soft pillows. Outside your room, helpful amenities are just steps away. Join us for convenient and delicious dining, with breakfast and dinner options. Or if you’re just looking to unwind, we have a secluded whirlpool and two outdoor pools. A relaxing dip is right outside your room, all year round. For more of the features and services we provide, check out all of our amenities. Book a stay at Best Western Garden Inn for all of the best lodging in Santa Rosa, with the convenience of an amazing location close to downtown, the County Fairgrounds, and Highway 101. Ideal for families and groups of friends, this lovely two-room suite provides plenty of space to stretch out and relax. This suite is outfitted with a king bed in a private bedroom, and two queen beds in a second room, with space for a rollaway if requested. This room also features free Wi-Fi, a microwave, refrigerator, and a digital TV with premium channels. This cheerful hotel room in Santa Rosa has two queen beds and is a top choice for families, friends, or couples that prefer a little more sleeping space. 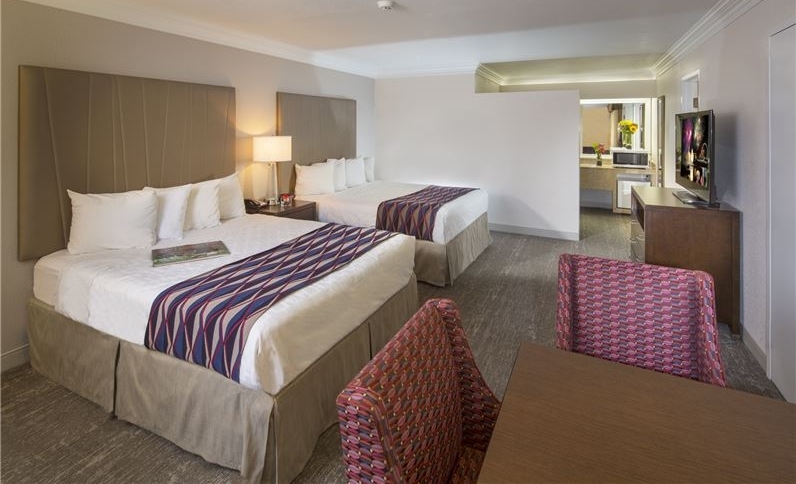 Relax on top-quality bedding, stay connected with free Wi-Fi, and enjoy a microwave, refrigerator and premium channels. Our charming lodging in Santa Rosa provide a tranquil and serene setting to relax on a vacation to Sonoma Valley, or the calm surroundings you need for a work trip. With fast Wi-Fi, all the space you need to focus or to relax, and all the small details taken care of, our rooms are a welcome getaway. Unwind in these oversized hotel rooms, which feature one king-size bed and plentiful amenities: large vanity, free Wi-Fi, microwave, refrigerator, and TV with premium channels. Some deluxe rooms have patio doors that open out onto our landscaped garden area. Equipped with a king-size bed with comfortable mattress, plush linens, and plenty of pillows, this room is nice and relaxing. Each standard king room also offers free Wi-Fi, blackout drapes, microwave, refrigerator, and premium channels on a digital TV. You'll find one queen-size bed in these popular hotel rooms in Santa Rosa, along with high-quality linens and your choice of pillows. Enjoy free Wi-Fi and free local calls, along with a refrigerator, microwave, and TV with premium channels. There's room for family and friends in our 2 bedroom, apartment-style suite. This room includes a full kitchen, and a living room with a queen sofa bed for any extra guests. The private bedrooms in this spacious suite both boast king beds. Unwind in these accessible hotel rooms, which feature one king-size bed and plentiful amenities: free Wi-Fi, microwave, refrigerator, and TV with premium channels. Some deluxe rooms have patio doors that open out onto our landscaped garden area. This cheerful accessible hotel room in Santa Rosa has two queen beds and is a top choice for families, friends or couples that prefer a little more sleeping space. 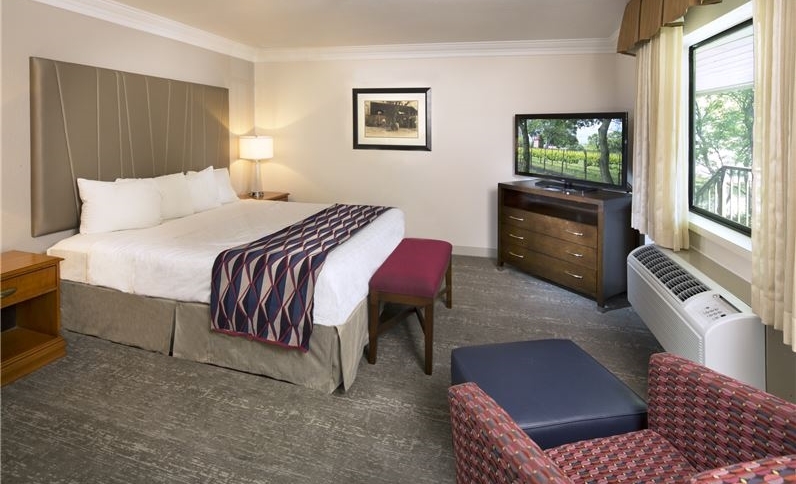 Relax on top-quality bedding, stay connected with free Wi-Fi, and enjoy a microwave, refrigerator and premium channels.